Wedding is an event that every girl looks forward to in her life. Right from planning the bridal trousseau to the jewelry, there are so many choices to be made, to make your ultimate dream come true. Though you have been planning for years and months, yet when it comes to the wedding-day, nothing seems to look so attractive. Expectations run high as you want to look the best among all-after all it is your special day. Also, the Jewelry of the Bride is the most discussed topic at the wedding and even for the years to come, so it becomes even more important to choose the right Jewelry that compliments you dress and personality perfectly. Here in this write up we will discuss some crucial tips for solving the dilemma of choosing the perfect Bridal Jewellery. Time and Season : Always select the bridal jewelry keeping in mind the time of the wedding. While choosing opulent Jewelry always keep in mind to wear flashy Jewelry in the night-time only. Heavy jewelry is ideal in winters, while in summers you should keep it light in order to be comfortable. Consider your Skin Tone : Complexion definitely plays a major role while selecting Wedding Jewelry. Opting for Yellow gold jewelry when you have a Dusky look is a big non-no. Instead, go for a color that suits you best by trying other types of jewelry like Platinum, Silver or Golden jewelry in different shades like white or rose gold. As for girls with a peach and cream complexion, they can opt for shades that would not look gaudy but rather enhance their color. The key is to wear something that enhances your complexion. Gemstones : The heart of any Jewelry : Generally Gold Jewelry and all other Jewelry with semi-precious stones are preferred, but if you are looking for something contemporary, then buying from the leading brands is the best option. 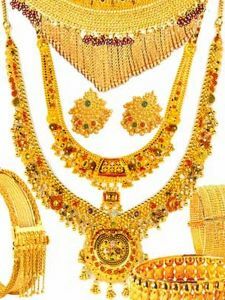 Presently, traditional Kundan jewelery is very popular among brides as it can be styled and matched in a number of ways. Diamonds are also an excellent option and can be combined with other gemstones. Keep it subtle by avoiding multicolored stones in one piece. Buy Smartly : While you have every right to splurge the most on your wedding trousseau and jewelry; remember to buy something, which you can later wear on other events or occasions. Otherwise you will be left with a costly set of elaborate jewelry that only graces your cupboard. Consider several br ands and jewelry makers to make the right choice. Choosing Wedding Jewelry can be really easy if you just consider the fact that it needs to be something that looks good on your personality. Remember to buy Jewelry that is comfortable as the wedding day is always tiring for the bride. Just keeping these few tips in mind will surely make you the center of attention, making your Wedding day special and memorable for you. Marriage is the most important occasion and the jewelry which you choose for wearing that day is very important which will make you look gorgeous. It will make you remember that day for life long. The Jewellery should not be heavy, It should be very light, because the bride has to wear the heavy dress all day long than it would be quite uncomfortable for wearing heavy jewellery too. Also, one important thing you must keep in mind is not to buy a jewellery especially a gold jewellery with more stones, because they are priced high but actual their value is not that. I really like your tip for considering skin tone. Gold jewelry for example looks great with certain skin tones but with others, not so much. Nothing better than Google finding us a good website related to what I was looking for. Valuable information. Lucky me I found your site by accident, I bookmarked it.